Sienta cómo aumentan sus niveles de adrenalina en una excursión a la jungla de medio día desde la ciudad de Belice. 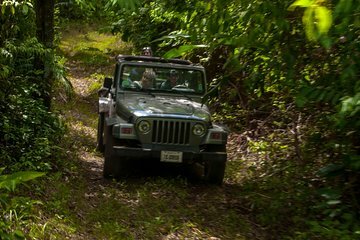 En un poderoso 4WD, disfrutará de un conciso recorrido por las vibrantes calles de la ciudad de Belice y se adentrará en la vegetación atmosférica de la selva de Belice para observar la fascinante flora y fauna. Explore cuevas escondidas, maravíllese con las formaciones rocosas cristalinas y recorra el paisaje en busca de vida silvestre poco común mientras escucha los comentarios informativos de su guía. Revitalícese con un delicioso almuerzo, acompañado de bebidas, y disfrute del transporte de ida y vuelta desde su terminal de cruceros de la ciudad de Belice. Excursión de medio día a la jungla desde la ciudad de Belice. Realice un recorrido informativo por las vibrantes calles de la ciudad de Belice. Adéntrate en los misterios tropicales de la selva de Belice en un 4x4. Disfruta de un almuerzo acompañado de bebidas. Amazing adventure! Bring your drivers license and passport if you want to drive the jeep. Otherwise, sit back and enjoy! Not worth the money and you go through the worst parts of town, madder of fact I don't think there was a nice part. I had pictured Belize to be a much nicer destination but this excursion made me not ever want to go back to Belize. Nice tour guide. Just two of us and the guide. We went to one cave bring bug spray!! !, went off road and had a lovely lunch. He droves us through the streets of downtown Belize. Nice tour. This was an unforgettable experience. Our tour guide was upbeat and knowledgeable. Our group of three had our own jeep as we followed the tour guide into the jungle. We even explored a cave. Following our tour, we relaxed under a cabana and had a homemade lunch made by our tour guides family. This included coconut milk right out of the coconut! YUM. LOVED the adventure. We had an excellent time on this excursion! At first we were reluctant to book this because it was new and there were no reviews available at the time. We are so very glad we went ahead and did it! If you want a great tour of Belize City and are adventurous enough to get off the beaten path get a little muddy, hike into the jungle and explore deep into a cave most people would never get to see then this is for you. When we arrived Jose met us just outside the gate with a big sign with our names on it, it was easy to find him and there wasn't any question about where we were suppose to be. He had the jeep right there we jumped in and he took us on a tour of the city on the way out of town. We stopped at a small local gas station where we got a coke for the road. Once we turned off the highway onto gravel road Jose stopped and let me drive and Sherrie took the front seat, Jose was in the back seat. After a mile or so, we turned off gravel onto a small muddy path. Driving through the jungle was muddy with deep mud holes and a creek crossing as deep as the hood of the jeep. If you chose to drive its best that you are skilled at driving in mud and pretty extreme offroad conditions. Half way through we stopped at the cave entrance. Hiking up to the cave was steep and the opening to the cave was small and SPECTACULAR. Be in relatively good physical condition to do this. Back at the jeep we finished the drive through the jungle, followed a beautiful river road to the place for lunch. Lunch was already prepared and waiting for us. The local cuisine was outstanding, we both wanted 2nds but we were stuffed as the 1st serving was huge. Marta the cook was wonderful! After lunch we drove back to the city and toured more of the city. Jose was an outstanding tour guide and not only knew the city well he taught us a lot about the many plants, trees, and wildlife in the jungle. The only bad thing about excursion was that it ended. We cant wait to go do it again! !